Slimming World Diary: Aching & Cheesecake ..
Ow. I am in some pain, on my legs and stomach. Gemma had me and Gareth doing circuit training in the gym yesterday afternoon and I can feel it. I mean it was a great workout, I was panting by the end of it but my god I hurt today. I've just come back from doing a few lengths in the pool to maybe ease my muscles, it helped a little. 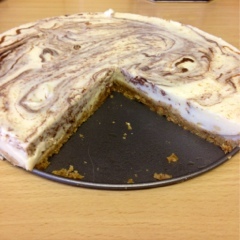 Last night I made vanilla & chocolate cheesecake so it would be ready for lunch today. The dish serves 10 and each slice is 6 syns. Not bad for a lovely dessert. Here's how its made. 1. Mix the biscuits with the spread in a bowl, then spoon into a 20cm diameter, non-stick, loose-bottom cake tin. Flatten with the back of a fork, cover and chill in the fridge for about 30 mins. 2. Meanwhile melt the chocolate and allow to cool a little. 3. Sprinkle the gelatine into 75ml of boiling water and stir to dissolve. Put the Müllerlight, quark, extract, sweetener and gelatine mixture in a food processor and blend until smooth. Pour in the mixture of the biscuit base and swirl in the melted chocolate. Cover and chill in the fridge overnight. 4. Serve by cutting into 10 slices, try adding some raspberry to add a little fruit. 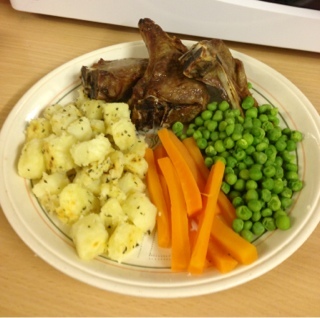 Before I went out swimming I made Grilled Lamb Cutlets with sautéed Rosemary Potatoes. Absolutely delicious and syn free. 1. Bring a large pan of lightly salted water to the boil and add the potatoes. Boil for 8-10 mins or until just tender. Drain thoroughly. 2. Spray a large, non-stick frying pan with Fry Light. Add the rosemary, garlic and potatoes. Stir-fry over a medium heat, turning the potatoes regularly for 6-8 mins or until golden. 3. Meanwhile mix together the Worcestershire sauce and soy sauce and brush over the lamb. Season well on both sides and place under a medium-hot grill. Cook for 5 mins on each side or until cooked to your liking. Remove from the grill and serve with the sautéed potatoes and vegetables.